Farming is one of the most dangerous occupations in Northern California and particularly in the North Bay with its beautiful, idyllic grapevines, vineyards, and particularly with regard to its rugged terrain. Although agricultural work is often a rewarding way to support your family, it can be very dangerous and even deadly if land owners, operators, and farm equipment manufacturers do not take safety seriously. Every year, farm workers are injured through accidents involving heavy machinery, dangerous chemicals and even common workplace accidents such as slip and falls. Some vineyard workers end up suffocating in a vat or wine tank or cylinder. Tractor Overturn Deaths. Every year, approximately 100 U.S. farmers are killed when their tractor rolls over during tilling or some other use. Many others suffer serious injuries during tractor overturn accidents especially in rugged and steep terrain in Sonoma and Lake Counties. Falling Farm Structures. Unfortunately, many farm and vineyard workers suffer serious injuries sustained in falls from farm equipment, bins, ladders, haymows, or other farm structures. Others are struck by falling objects. Farm Machine Entanglements. In addition, farm and vineyard workers have been seriously injured, maimed, disfigured or even killed when they become caught in farming machinery such as augers or other harvesting machinery. Suffocation Accidents. Farm workers and vineyard workers may become trapped in a wine tank or bin or suffocated in the same. Other farm workers have become trapped in enclosed spaces that do not have proper oxygen levels or that are contaminated with methane or manure gas. When a farm employer does not discontinue or disclose to the vineyard worker the use of a broken, defective, or faulty piece of equipment. When a farm employer does not properly train or supervise its workers to use the farm equipment. When a farm employer, owner or operator deliberately removes safety devices from a piece of equipment to increase its efficiency or for other reasons, making the equipment more dangerous. When a piece of farming equipment is inherently defective or dangerous. When a farm or vineyard equipment company does not put adequate warnings on their products or machinery. No matter the cause of your farm or vineyard accident, if you have sustained a traumatic injury while working on a farm, vineyard, ranch or rancheria, you may be entitled to full compensation for all of your medical expenses, lost wages, and personal pain and suffering. It is important to remember that workers’ compensation laws are different for farm laborers and farming and vineyard accidents are not always covered by this no-fault insurance so it is important to seek the advice of an experienced and skilled attorney at the Law Offices of Michael A. Fiumara. Please contact us 24/7 at either our Sonoma County, Santa Rosa office at (707) 571-8600 or our Marin County office in San Rafael at (415) 492-4507 for the office most conveniently located for you. The best way to determine what damages you are entitled to seek is through a one-on-one consultation with North Bay farm and vineyard accident attorneys, Michael A. Fiumara and Justin O. Milligan at the Law Offices of Michael A. Fiumara. At the Law Offices of Michael A. Fiumara, we are strong advocates for injured farm and vineyard workers throughout Northern California and especially in Sonoma, Napa, Mendocino and Lake Counties, where these types of accidents are more prevalent. Our clients include injured pickers, packers, processing plant workers, transportation drivers, and others in the agriculture industry. Injured vineyard workers in the fast growing wine industry in Sonoma and Napa Valleys have suffered a disproportionate share of farm-related injuries in recent years. There have been so many complaints and incidents that oftentimes the California Occupational Safety and Health Administration (OSHA) has had to launch investigations which we have used as a basis for a civil lawsuit. Our lawyers have a proven track record of success obtaining results for injured farm and vineyard workers. Farms and vineyards can be dangerous places to work, exposing workers to all kinds of accidents that can leave them injured and disabled even years down the road. Injuries caused by livestock and other farm animals. Head, neck, and back injuries. Exposure to pesticides and other toxic and carcinogenic substances. Farm injuries are not always the result of a specific accident. Repetitive stress-related injuries such as back injuries and carpal tunnel syndrome can develop over a long period of time, having a debilitating effect on farm workers no matter what their age. What comes to mind is the vineyard and vine trimmers in the grape and wine industry performing the same job day in and day out without any respite. Farm and vineyard work often requires repetitive motion such as stooping, crouching, bending, and use of the hands. Days, weeks, and years of these repetitive motions can take their toll, leaving farm and vineyard workers temporarily or permanently disabled. Our law firm is equipped to help you in all aspects of your farm or vineyard accident case, including securing workers’ compensation benefits, or identifying third-party liability in a personal injury lawsuit. We also help injured farm and vineyard workers obtain Social Security disability benefits. 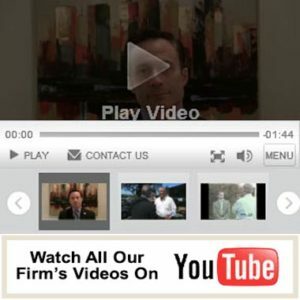 However, whenever a third-party, other than the employer is negligent in an accident injury at a farm or vineyard, it is best to consult with a highly skilled and experienced North Bay farming and vineyard accident lawyer in the Law Offices of Michael A. Fiumara to assist you obtain the full benefits that you deserve.